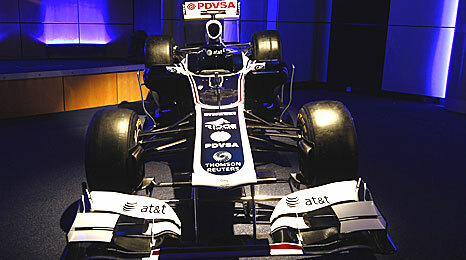 Williams finally showed off their car in its final form today with the definite colour scheme it will sport for the 2011 season. Upon first glance, it isn’t a whole lot different from the last several years, but for several new details which harken back to the 1990s when the team was sponsored by Rothmans. It’s a cool retro look in a way, going along with the current trend of retro coming back, as seen with the Lotus Renault black and gold. I generally have preferred the Williams cars of the past that have been more white than navy but this one is still a cool looking car. I suppose it makes sense for them to differentiate themselves from the rest of the field, and navy blue is the definitive colour of the team. Sam Michael and the team are talking positively about the team’s chances this year. While they have some encouraging signs with how their car is designed, I’m reluctant to commit to any such thoughts myself until we’ve seen a few races. The issue is that every team always say that they’ll improve, but I just have this bad feeling that they will fall greatly short of these lofty aims. After watching and loving the end of the Daytona 500 recently, it pains me to see how pitiful F1 continues to be in making teams as equally competitive as possible. Practically nothing is being done to ensure a level playing field. The closest F1 will ever get to a Trevor Bayne story is Lewis Hamilton’s immediate impact in 2007 but that was only because of his extraordinary talent and belief, and in no small part because he was raised in motorsport terms by McLaren. Still, back to the subject, I think Williams should be better this year and you would assume they will stay ahead of Force India and the other midfield teams, by more than a single point this time too. Considering how many important members of staff Force India have lost to Team Lotus and Sauber, it’s hard to see how they can keep their development at a high enough level to challenge the Grove based team. Whether they can edge closer to Renault and Mercedes is less likely, but it would be a great story if they could do so. This team is not lacking in funding and they need to put their money and brain-power to good use to get themselves back to where they should be, fighting for wins at the very least.